The picture below shows a Tapered Headrace Bearing Set (By All Balls USA). Thousands of other top quality spares listed on our website at refreshingly low prices. On models with tapered original steering head bearings All Balls heavy duty tapered bearings function as a high quality direct replacement. 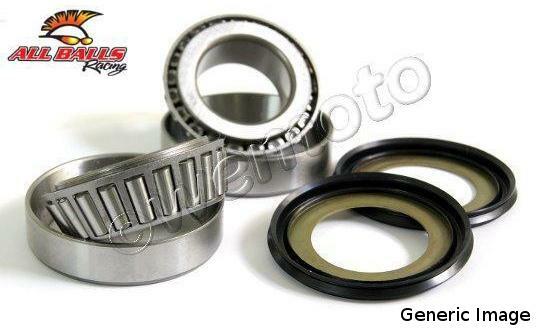 On models that originally took ball-type steering head bearings, All Balls tapered bearings can be used as an upgrade. Ball-type bearings have tiny points of weight-bearing contact area, which means that ball type bearings have a much shorter lifespan than a tapered bearing, where the weight is spread across the long surface of a cylindrical roller. In addition, tapered bearings are far easier to install and do not have the issue of over or under-tightening of the original uncaged bearing design which could cause handling problems. 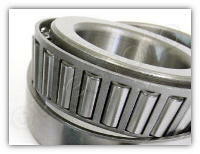 All Balls tapered steering head/headrace bearing kits contain the upper and lower bearing and seals where appropriate.